Adrienne Lyle (USA) and Wizard capped off the first day of competition for the final week of the Adequan® Global Dressage Festival (AGDF) with a win in the FEI Grand Prix CDI 5* presented by Diamante Farms. The pair earned a personal best score for the grand prix with a 74.160%. Ashley Holzer (CAN) and Tiva Nana scored a blue ribbon finish earlier in the day, winning the FEI Grand Prix CDI 3* presented by Diamante Farms on a score of 70.000%. AGDF 12 is sponsored by Diamante Farms and Wellington Equestrian Realty. Friday, March 28, will see the return of “Friday Night Stars” to The Stadium at the Palm Beach International Equestrian Center (PBIEC). The featured class, the FEI Grand Prix Freestyle CDI 5*, will begin at 7:00 p.m. on Friday evening. Young rider Bebe Davis will perform her own freestyle exhibition as part of the night’s festivities, and a vocal quartet accompanied by piano from the Frost School of Music at University of Miami will perform throughout the night. in the FEI Grand Prix CDI 5*! Adrienne Lyle was also presented with the Champion Equine Insurance Dressage Style Award and a crystal horse from Swarovski for her win in the FEI Grand Prix 5*. The American rider topped the class with Wizard, a 15-year-old Oldenburg gelding owned by Peggy Thomas. Second place went to fellow American Tina Konyot and Calecto V for their score of 72.720%, while Danish rider Mikala Gundersen rounded out the top three with My Lady and a score of 72.520%. Lyle was thrilled to post her all-time grand prix high score with Wizard in the on Thursday evening. A triumphant return to the ring was the best she could have asked for after having to withdraw Wizard from the AGDF 10 CDI W.
Adrienne Lyle and Wizard. Photo by Susan Stickle. Lyle admitted to having a good feeling about their test, but insisted a rider can never really know when they’re going to have the “test of tests” before it’s over. Her main focus, and possibly the difference in their score, was the extended trot. “I think he’s got a great, amazing, trot extension, but I think we lose a little balance. He gets a little tight, and we’ve done some skip steps a couple times. So we came in around the outside of the arena, and I really made him gallop around a couple times and got going. I felt like I was able to ride it, not to not have a mistake, but to have more power and really go for it and not feel like I was being conservative,” Lyle described. Lyle will forgo the FEI Grand Prix Freestyle 5* on Friday, opting instead to contest the FEI Grand Prix Special 5* in preparation for the Alltech FEI World Equestrian Games (WEG) selection trials. “I love doing the freestyle with him, but he just had a couple weeks off and he hasn’t been working that much before the show, I thought it would be smarter to put him in the special. He doesn’t need to get himself all hyped up again. I’ve done the freestyle the last two shows. I think I need to get back to focusing on the special a little for the trials,” Lyle explained. Second place finisher Konyot is known for her jubilant expressions after a test with Calecto, but explained that her serious look on Thursday evening was not a reflection of the overall test. Konyot pointed out her canter tour as the highlight of the test for her, along with a trot tour she thought was well done. With the FEI World Cup Dressage Finals next on her calendar, she was pleased to have achieved her main goal for the class. “I felt great because I had a better grand prix. I often have quite a good freestyle, and since I am leading North America and going to the World Cup, I was happy that I could have a better grand prix. That was something that I was looking towards,” Konyot said. Gundersen and My Lady have a different championship competition looming; their sights are set on the Danish Championships, an event Gundersen described as one with the most pressure of the season. The show plays a large role in choosing the Danish team for the WEG this fall. Gundersen has been more than satisfied with how My Lady has progressed throughout the season in Wellington, describing her test on Friday evening as very rideable and supple. “I could have had a little more energy from behind, but I had a lot of really good movements. There were some things that I worked very hard on, to get better, and they were. I look at my scores and see that they got better, and then I lost a bit on other things,” Gundersen shared. On behalf of all the riders, Gundersen expressed her gratitude for the AGDF hosting a 5* event and thanked the sponsors of the show for their generosity. In only her second outing at the CDI level, Tiva Nana enjoyed a victory with Ashley Holzer earlier in the day during the FEI Grand Prix 3*. Holzer finished at the top of the class with a score of 70.000%, while American Laura Graves took second with Verdades on a score of 69.140%. Third place went to Megan Lane (CAN) and Caravella, who earned a score of 69.120%. Ashley Holzer and Tiva Nana. Photo by Susan Stickle. Tiva Nana, a 14-year-old KWPN mare, has been owned by Marissa Mastranardi for the past five and a half years. When Mastranardi asked trainer Holzer to ride the mare in September, she handed the reins over to her full-time. Tiva Nana, known as “Nina” in the barn, has continued to step up to the plate as she has progressed up the levels. 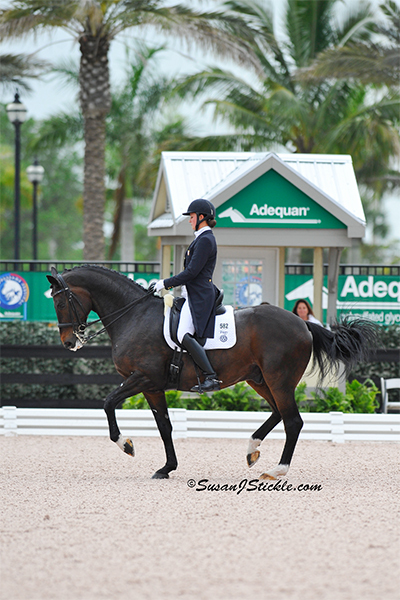 Thursday was only the horse’s second CDI and fourth time completing a grand prix test. Holzer admitted she would have to rethink her plan after what the mare showed her in the ring. “I have to sit down and really rethink that after today. She really showed me something in this main ring. We thought she would take a much longer time to settle in this big ring,” Holzer acknowledged. Second place finisher Graves was thrilled with Verdades’ rideability throughout the test, noting that the pair have enjoyed great improvement over the last three months at the AGDF. She’s worked with Olympian Debbie MacDonald since the beginning of the circuit on various aspects of Verdades’ training. “It’s gotten so much better since our first CDI. It’s a little sad that the season is over for us, because we’re kind of hungry for more and hitting our stride,” Graves explained. Graves has her sights set on the Festival of Champions in Gladstone, NJ, which also serve as the selection trials for the American team to go to the WEG. Of her test today, Graves pointed out the biggest turning point for the test was the piaffe, which she admitted she had been going down centerline and “praying” to go well in each previous test. “There’s nothing more terrifying than having to do something on a centerline and just having to go in there and praying. That’s pretty much all we’ve been doing, because he wouldn’t let me touch him,” Graves explained. Lane has also focused on progress at each competition with Caravella. The pair won the FEI Grand Prix Special during AGDF 1, and both rider and horse have benefitted from the experience of six CDIs over the course of the season. “I think both her and I are relatively inexperienced, so the more we get out there, the better. Coming to Wellington, you can only get it here,” Lane pointed out. With Caravella, it’s just a matter of channeling her nervous energy into precise focus in the show ring. “Although she’s extremely talented, she gets a little nervous in the piaffe, which affects our transition to passage. Today, that was excellent. I was really happy with her,” Lane smiled. Junior and Young Rider competition kicked off the first day of the AGDF 12 CDI 3*/5*. Paula Matute (ESP) earned top call in the FEI Junior Team aboard Firmamento Ymas with a score of 70.946%. In the Young Rider Team Prix St. Georges test, it was Laurence Tetreault (CAN) and Lowelas who emerged victorious. The pair earned a score of 68.860% for the first place prize. In a special award of the night, Lars Petersen (DEN) was presented with the FEI Grand Prix Circuit Championship for his scores with Mariett. They had the highest cumulative of average scores competing at a minimum of four CDI competitions at the AGDF. ESP’s Cora Causemann with Lars Petersen. Photo by Susan Stickle. Competition for the AGDF 12 CDI 3*/5*, presented by Diamante Farms and Wellington Equestrian Realty, will continue on Friday at 8:00 a.m. with the FEI Prix St. Georges. The FEI Grand Prix Special 5* will begin at approximately 3:30 p.m. and the FEI Grand Prix Freestyle 3* will follow at approximately 4:45 p.m. The featured class of the week, the FEI Grand Prix Freestyle CDI 5*, will begin at 7:00 p.m. For more information and complete results, please visit www.globaldressagefestival.com.